Great characters, strong writing, and a clever solution to the mystery make this one of 2018's best. He'd changed again in some way. Like he had the night in The Jericho putting out The Jive. But this was different again. The Jive was showmanship. The good Doctor Slidesmith in full sail. This was more intense. I'd see him like thus on occasion in the shop, absorbed in the ink and the song of the needle. I wouldn't say lost in what he was doing. Lost implies lack of control. 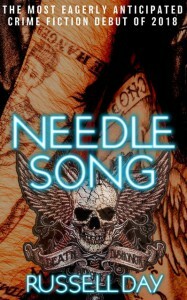 Back when I posted about the short story featuring Doc Slidesmith, Not Talking Italics, I said that if Needle Song was anything like it, "I'm going to have to go down to the superlative store this weekend to stock up before I write anything about it." I'm fully stocked (now) and ready to go. I was disappointed -- somewhat -- and relieved to see that the all-dialogue, no narration, no other description approach of Italics was nowhere to be seen. I could've read 380 pages of that (see my love for Roddy Doyle), but I know it's not that approachable and will turn off some readers. Now, I don't know if anyone but Karen E. Olson has envisioned a tattoo shop as a hotbed of crime fighting -- or the staff of such to be the source people would turn to for help with legal difficulties. But it works -- all because of the owner of the shop, former psychologist, current Voodoo practitioner and Tarot reader, Doc Slidesmith. On the surface, you see a rough-looking -- striking, I think, bordering on handsome -- but your basic leather-glad biker type, covered in ink -- and will underestimate him. Only those who've been in conversations with him, those who've given him a chance will see the charm, the intelligence, and the indefinable characteristic that makes people come to him for help in times of trouble. In many hands, Doc's...peculiar resume, shall we say, would end up this cartoonish mish-mash of quirks. But Day is able to make it work -- there's a reason that Doc ended up where he is, we don't need to know it, but it makes him the man (and armchair detective) that we want to read about. Andy Miller -- known to many as "Yakky" (he's not a chatty type, his tattoos are all placed so that he can hide them all with this clothing, like a member of the Yakkuza), is the tattoo apprentice to Doc Slidesmith. He lives with his father -- a thoroughly unpleasant and manipulative man, that Yakky feels obligated to care for. While clearly appreciative for Doc's tutelage, and more in awe of his mentor than he'd care to admit, he's also more than a little skeptical of Doc's interests, beliefs and practices that aren't related to his tattooing. He's our narrator. He's not your typical narrator -- he's too frequently angry at, dismissive of and unbelieving in the protagonist for that. Which is just one of the breaths of fresh air brought by this book. Yakky is singularly unimpressed by Doc's playing detective -- but in the end, is probably as invested (maybe more) in the outcome. Jan is brought by Chris Rudjer (a long-time client and friend of Doc's) for a Tarot reading, which brings her some measure of comfort/reassurance. So that when, months later, her husband kills himself, she comes looking for another reading -- which turns into seeking help in general. Not just for her, but for Chris, with whom she'd been carrying on a not-very-secret affair for months. While it seemed obvious that her husband had taken his own life when she found his body, there were some irregularities at the scene. When the police add in the affair Jan was having with someone with a record for violent crime, they get suspicious. Slidesmith does what he can to help Chris prepare for the inevitable police involvement, and enlists Yakky to help, too. Yakky takes Jan home to stay in his spare room. She can't stay at home -- the memories are too fresh, there are problems with her husband's family, and (she doesn't realize it yet) there are people following her and Doc and Yakky are worried. The dynamic between Jan and Yakky, and between Jan and Yakky's father, end up providing vital clues to her character and psychology. This will end up proving vital to their case. As Doc and Yakky begin digging around in Jan's life, it's immediately obvious that very little is as it seems. Now, if you're used to reading Crime Fiction featuring serial killers or organized crime, you'll think a lot of what they uncover is pretty small potatoes. But it actually seems worse -- it's more immediate, more personal -- serial killers have their various pathologies, mobster's are after profits and power -- these people are just about hate, cruelty and control. Maybe it's just me, but it seems worse in comparison. There's a depth to all of these characters that I could spend a lot of time thinking/writing/reading about -- for example, our narrator, Yakky. I have at least a dozen questions that I feel I need answers to about him. At the same time, I think at least eleven of those answers could ruin the character for me. Ditto for Doc, Gina (another artist in the shop), or Chris. It's a pretty neat trick -- one few authors have been able to pull off, creating a character that you can tell has a compelling backstory, but that you don't really want to know it (see Parker's Hawk or Crais' Pike -- or the other mercenary Crais has had to create now that we know too much about Pike). I know who these people are now, and look forward to seeing what happens with them -- and that's good enough. It's hard to tell, always, just why Doc's working on this -- is it for fun, is it out of a sense of obligation to Chris, does he feel bad for Jan, is it some of all three? Yakky will frequently talk about The Jive -- the showmanship that Doc brings to Tarot readings, conversations, and dealing with difficult witnesses -- it reminds me frequently of B. A. Baracus' complaining about Hannibal's "being on The Jazz." The plot is as intricate as you want -- there are twists, turns, ups, downs -- both with the investigation and in the lives of those touched by it. This doesn't have the flair of Not Talking Italics, but the voice is as strong, and everything else about the writing is better. It's a cliché to say that Day paints a picture with his words, so I won't say that. But he does etch indelible patterns with the tattoo-gun of his words -- which isn't a painless process for all involved, but the end result is worth whatever discomfort endured. Day doesn't write like a rookie -- this could easily be the third or fourth novel of an established author instead of someone's talented debut. I'm torn on what I think about the details of the ending, wavering between "good" and "good enough, but could have been better." It's not as strong as the 94% (or so) before it, but it's probably close enough that I shouldn't be quibbling over details. I'm not talking about the way that Doc elicits the answers he needs to fully explain what happened to Jan's husband (both for her closure and Chris' safety), nor the way that everything fits together just perfectly. I just think the execution could be slightly stronger. Whether you think of this as an amateur sleuth novel, a look into the depravity of the suburbanite, or an elaborate Miss Marple tribute/pastiche, the one thing you have to see is that this is a wonderful novel. I'm underselling it here, I know, this is one of those books that you best understand why everyone is so positive about it by reading it. You've got to expose yourself to Doc, Yakky and Day's prose to really get it. One of the best books I've read this year. My only complaint with this book? After reading so much about the "song of the needle," the shop, the work being done there -- I'm feeling the pressure to get another tattoo myself, and soon.